When Did Mediocre Become the New Standard? Is it just me or is this really happening? This topic has come up several times recently in personal conversations, but I want to open it up for a wider discussion. The other day I saw a Facebook friend post a status update asking if anyone knew of a trustworthy person or company to finish a bath remodel. It was obvious that this friend previously had a bad experience with a contractor who didn’t follow through on what they promised. She got several replies from another friend who had a great referral but the guy was booked solid. What qualities do you think this “amazing” contractor embodies? While I can’t be sure, I’m going to go out on a limb and guess that they show up to appointments and jobs on time, perform quality work, and have a certain level of integrity. Have you noticed that contractors who simply do the above are considered AMAZING? It’s not that they’re even going above and beyond – they’re just doing what they’re supposed to in the first place. Another conversation I had was with soon-to-be neighbors who will be moving into the house across the street. They’ve been stopping by to scope out the construction as the build progresses. On one visit they noticed a large hole in the concrete slab on the first floor and assumed the workers would fill it in before installing carpet, right? The next time, that room was carpeted but it was placed right over the hole. That means when someone steps in that spot, they will “sink” into it. In what world would this be considered an acceptable quality of work??? Look around – you can probably point out quite a few examples of this just off the top of your head. Credit card customer service lines that take you deeper and deeper into “phone space” and then you end up talking with someone where there’s an obvious language barrier. When you’re at a store and you try to get help with anything that’s not within the standard realm of a few basic functions employees are used to. Walmart once flat out refused to sell me a collapsible pet crate that was not in the original packaging because they couldn’t find it in their system to determine a price. It was the only one left, and I really needed one for Gato Cat. The manager was extremely rude, and I left the store. I filed an online complaint about the store, and another manager called me back hours later to tell me that if I returned to the store they would sell me the crate. Ummm, really dude? I’m not driving back to the store after being long gone, only to give you my money after being treated poorly. The fact that this manager thought that would be a “solution” I would be satisfied with is pretty sad. My last example is with our house – new construction purchased last year. We had no idea what headaches came with it as a package deal. The builder was obviously not communicating with the county or with the United States Postal Service. A few days after moving in, I started to inquire why we were not getting any mail. I had forwarded our mail to the new address, and we had a mailbox. So I called our local post office, and first was told they would not deliver without street signs. Then I called the county and discovered they had no idea people were moving into the neighborhood and would come out to survey the area to determine where signs would be put up. After that, I was told by USPS they would not deliver until the builder installed cluster box units (CBUs). What? Then I learned that new homes can be required by USPS to install CBUs, eliminating door-to-door delivery. The builder had not been aware of that at all, and thought that because each house was assigned an address – they were good. Look lady, if I could get these CBUs put in myself – I would. But in this situation, all I could do was keep circling back with the builder. Haha – if only It were that easy! The showdown finally ended when the builder relented and installed the CBUs – almost THREE MONTHS LATER. Personally, I’m sick of this overall pervasive attitude that phoning it in is perfectly acceptable. It shouldn’t be. I refuse to live my own life like that. Why go through it being a subpar person? No one is perfect, that’s for sure. We all make mistakes and have a bad day every once in a while. But that doesn’t mean you can’t strive to be your best. If you’re chronically late, leave work early, or spend time there doing things that aren’t work-related, you know what you’re doing? You’re essentially stealing money from your employer. Those qualities may seem rather simple, but as a general population – we seem to be struggling with all of them. When I’m in the car, I’m usually listening to the Dave Ramsey show. One thing he says constantly that I really take to heart is that everyone should consider themselves self employed. It means that you need to be a self starter. If you stop showing up to work, you’ll stop getting paid. You are representing yourself and need to think about your personal brand. How are you marketing yourself to others on a daily basis? No matter what happens with your job situation, if your own brand is strong – you will always be employable. Up until a couple years ago, I really feel like I wasted most of my down time. I’d watch a lot of TV, hang out with friends, or go shopping. Not there there’s anything inherently wrong with those things, but none of the activities made me a better or more skilled person. Then I had another life transformation when sewing and quilting entered my life. If you don’t do either of those things, you can’t possibly understand the magnitude it carries. For me, it was like discovering a parallel universe. I’m not kidding. It really is a lifestyle and not just a hobby. I’ve learned so much since I got started, and don’t think I’ll ever stop acquiring new knowledge and techniques. Most of my free time is either spent sewing/quilting or working on Moore Approved. I will allow myself to watch TV or listen to radio podcasts while I’m going other things. It’s better time spent because I can accomplish more than one thing simultaneously. Instead of wandering through life, I now do things intentionally and with purpose. After all, who wants to go through life phoning it in? Even if others are okay with being mediocre, I’m not. I want to maximize my time and efforts to focus on things that actually matter. I refuse to accept mediocre as being alright – for myself and for the people I encounter in my daily life. 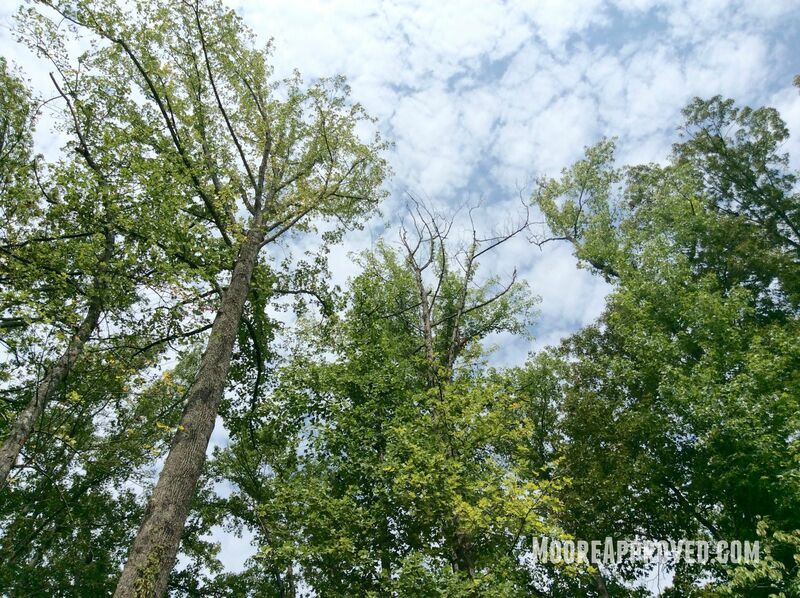 Thank you for taking the time to read and please share your thoughts on this topic! 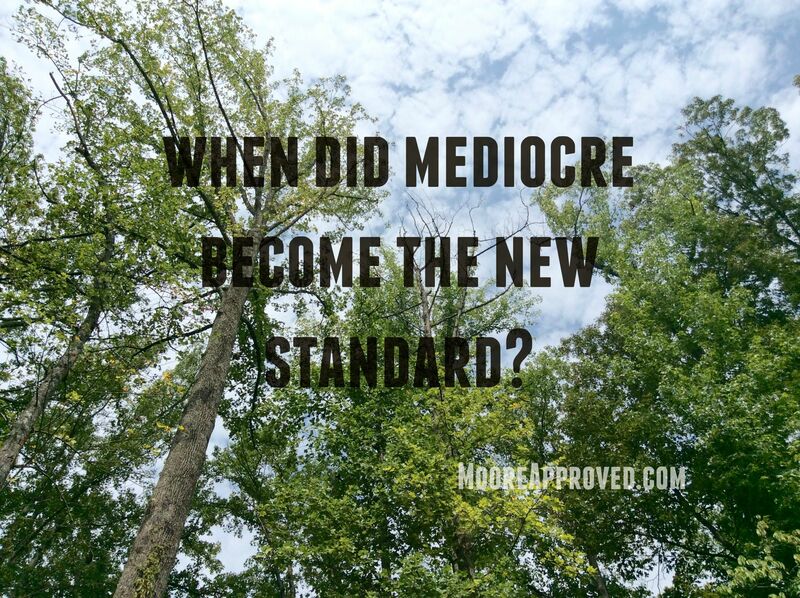 2 Responses to "When Did Mediocre Become the New Standard?" Those qualities are so rare in a contractor or even handy man today. I’d like to know, too, when mediocre became acceptable. I came upon this article, while searching for an article I read; “When Mediocrity becomes the Norm”. Everything in this article is on point.